Raised beds are becoming a very popular option in the garden as they are neat, easy to maintain and can provide a solution to a variety of problems. 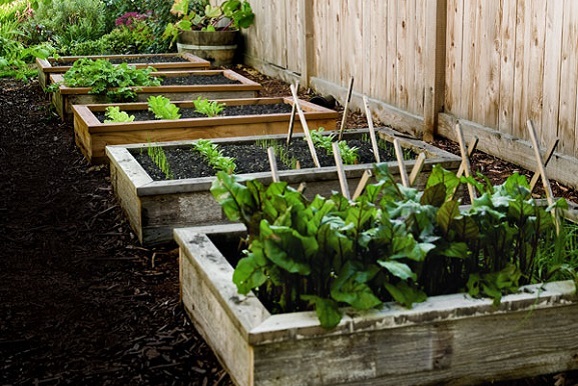 Not only are raised beds good for your health as you don’t have to bend down as much, but they are also easy to manage. Another bonus is that soil can drain exceedingly well in wet weather, but can also heat up nicely in spring. With all these benefits it’s no wonder so many gardeners are turning to use raised beds for growing their plants and vegetables. Width – It is recommended for the width to be approximately 1000mm wide, so that you can have easy access to all sides. Length – The space you have available in your garden will be the main factor to influence the length of the bed, as well as what you would desire for it to be. Height – With raised beds you are able to work to a height that you prefer. So if you wish to stand, kneel, sit on the ground or on the side of the bed, you are able to. Once you have decided on the size of your raised bed, before building it is then best to rake and level the ground so that the bed will lie flat. You can build a raised bed from numerous materials, such as paving slabs, softwood boards, timber posts, railway sleepers and brick. Most materials used for beds can be purchased from builders merchants and garden centres and all of which will help construct a strong stable foundation. The benefit of having raised beds is that you can decide on the soil that will best suit your planting requirements. We would recommend our Topsoil Supreme 10mm as it is a light airy soil and is ideal to fill any raised bed. We have added 30% of compost to this product, which gives the topsoil the additional nutrients needed to enable strong growth of your plants, shrubs and bulbs. Topsoil Supreme will also be great for vegetable raised beds and if you’re looking to add further nutrients our organic Cow Compost (from our own organic dairy herd) makes a good addition to any topsoil as it is a widely used growing medium for vegetable plots. After 12 months the raised bed will need topping up with soil/compost to ensure that nutrients are kept at a good level. Apart from this raised beds are simple to maintain and will not only add some variety to your garden, but can also make gardening a more enjoyable task for yourself.